Four unmodified plants (left) grow beside four plants (right) engineered with alternate routes to bypass photorespiration -- an energy-expensive process that costs yield potential. The modified plants are able to reinvest their energy and resources to boost productivity by 40 percent. Plants convert sunlight into energy through photosynthesis; however, most crops on the planet are plagued by a photosynthetic glitch, and to deal with it, evolved an energy-expensive process called photorespiration that drastically suppresses their yield potential. Researchers from the University of Illinois and U.S. Department of Agriculture Agricultural Research Service report in the journal Science that crops engineered with a photorespiratory shortcut are 40 percent more productive in real-world agronomic conditions. 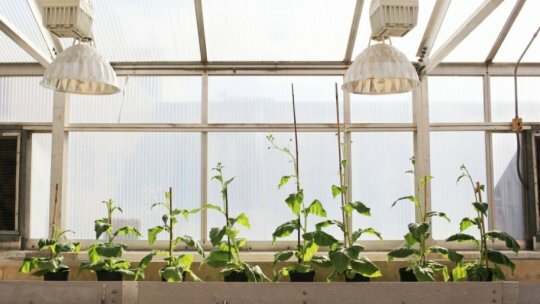 "We could feed up to 200 million additional people with the calories lost to photorespiration in the Midwestern U.S. each year," said principal investigator Donald Ort, the Robert Emerson Professor of Plant Science and Crop Sciences at Illinois' Carl R. Woese Institute for Genomic Biology. "Reclaiming even a portion of these calories across the world would go a long way to meeting the 21st Century's rapidly expanding food demands -- driven by population growth and more affluent high-calorie diets." This landmark study is part of Realizing Increased Photosynthetic Efficiency (RIPE), an international research project that is engineering crops to photosynthesize more efficiently to sustainably increase worldwide food productivity with support from the Bill & Melinda Gates Foundation, the Foundation for Food and Agriculture Research (FFAR), and the U.K. Government's Department for International Development (DFID). Photosynthesis uses the enzyme Rubisco -- the planet's most abundant protein -- and sunlight energy to turn carbon dioxide and water into sugars that fuel plant growth and yield. Over millennia, Rubisco has become a victim of its own success, creating an oxygen-rich atmosphere. Unable to reliably distinguish between the two molecules, Rubisco grabs oxygen instead of carbon dioxide about 20 percent of the time, resulting in a plant-toxic compound that must be recycled through the process of photorespiration. "Photorespiration is anti-photosynthesis," said lead author Paul South, a research molecular biologist with the Agricultural Research Service, who works on the RIPE project at Illinois. "It costs the plant precious energy and resources that it could have invested in photosynthesis to produce more growth and yield." Photorespiration normally takes a complicated route through three compartments in the plant cell. Scientists engineered alternate pathways to reroute the process, drastically shortening the trip and saving enough resources to boost plant growth by 40 percent. This is the first time that an engineered photorespiration fix has been tested in real-world agronomic conditions. "Much like the Panama Canal was a feat of engineering that increased the efficiency of trade, these photorespiratory shortcuts are a feat of plant engineering that prove a unique means to greatly increase the efficiency of photosynthesis," said RIPE Director Stephen Long, the Ikenberry Endowed University Chair of Crop Sciences and Plant Biology at Illinois. The team engineered three alternate routes to replace the circuitous native pathway. To optimize the new routes, they designed genetic constructs using different sets of promoters and genes, essentially creating a suite of unique roadmaps. They stress tested these roadmaps in 1,700 plants to winnow down the top performers. Over two years of replicated field studies, they found that these engineered plants developed faster, grew taller, and produced about 40 percent more biomass, most of which was found in 50-percent-larger stems. The team tested their hypotheses in tobacco: an ideal model plant for crop research because it is easier to modify and test than food crops, yet unlike alternative plant models, it develops a leaf canopy and can be tested in the field. Now, the team is translating these findings to boost the yield of soybean, cowpea, rice, potato, tomato, and eggplant. "Rubisco has even more trouble picking out carbon dioxide from oxygen as it gets hotter, causing more photorespiration," said co-author Amanda Cavanagh, an Illinois postdoctoral researcher working on the RIPE project. "Our goal is to build better plants that can take the heat today and in the future, to help equip farmers with the technology they need to feed the world." While it will likely take more than a decade for this technology to be translated into food crops and achieve regulatory approval, RIPE and its sponsors are committed to ensuring that smallholder farmers, particularly in Sub-Saharan Africa and Southeast Asia, will have royalty-free access to all of the project's breakthroughs.